Royal Musings: A Greek princess for Prince Harry? Pshaw! Australian women's rag, New Idea, has splashed a rather specious, but delectable story about Prince Harry. The magazine claims that Prince Harry is (gasp!) dating 19-year-old Princess Maria-Olympia of Greece and Denmark, eldest child of Crown Prince Pavlos and Crown Princess Marie Chantal of Greece. The marriage between a British prince and Greek princess would certainly set the world on fire .. well, at least the world that is interested in royalty. Olympia would not be the first member of the Greek royal family to marry a British royal. In November 1934, Prince George, the Duke of Kent, married Princess Marina of Greece and Denmark, whose handsome first cousin, Prince Philip of Greece and Denmark, married Princess Elizabeth in 1947. The British royals maintain close connections with members of the Greek royal family. King Constantine II, who lived in Hampstead for many years with his wife, Anne-Marie, sister of Queen Margrethe II of Denmark, and their five children, is one of the Duke of Cambridge's godfathers. The Duke of Cambridge is a godfather to Prince Constantine Alexios, who is Crown Prince Pavlos' second child and eldest son. Princess Maria-Olympia was born on July 25, 1996 at New York Hospital in New York City. Her parents were living in New York City at the time. 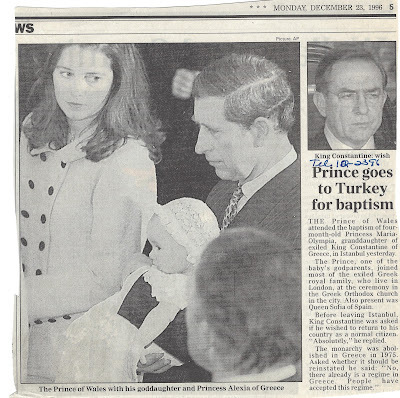 The infant princess was baptized according to the rites of the Greek Orthodox Church in Istanbul, Turkey. 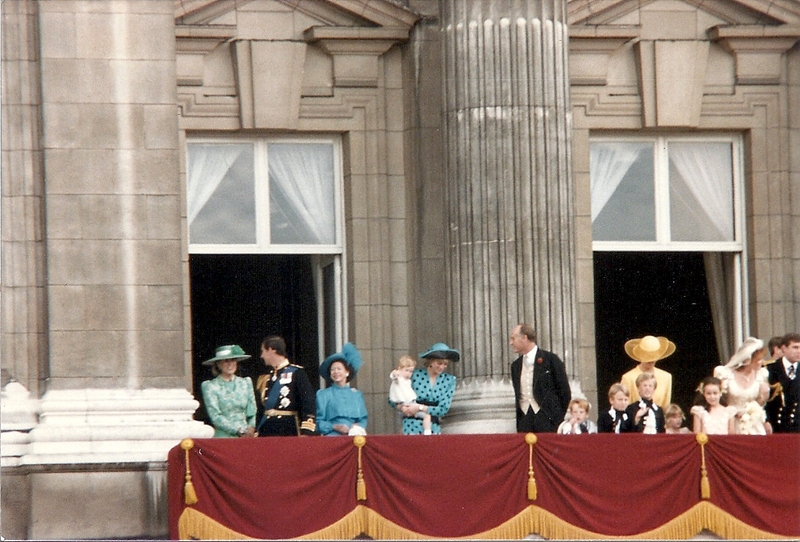 The Prince of Wales, Harry's father, is one of Maria-Olympia's godparents. Some years ago, he took his goddaughter to see the animated film, Shrek. In March 2014, Olympia was featured on the cover of Tatler Magazine as the "Most Eligible girl in the World." She studied drama, history of art, graphics and photography at a "sixth form college specializing in creative arts." The princess stated in the Tatler interview that "I'm dyslexic, so I am more creative and visual than academic." Last fall, she moved into a Soho apartment as she began her university education. Although some reports state that the princess is a student at New York University, this incorrect. She is a student at the Parsons School of Design, a part of the New School. Crown Prince Pavlos and Crown Princess Marie Chantal's main residence is in London, where the Crown Princess runs a successful children's clothing line. In 2015, King Constantine sold his home in Hampstead, and now lives with Queen Anne Marie in Greece. New Idea is nothing more than a spurious piece of printed merde! The article includes a photo shopped image of Harry and Olympia, and makes a rather silly claim that the couple have been on a "string of dates and are planning to go skiing in Switzerland before Easter." The Daily Mail, another rag, has jumped gleefully on the story, reporting it as fact, and probably sending reporters to stake out Olympia's home. Bianca London, the alleged writer of the latest Daily Fail story, has not even bothered to check facts. Had she done this, she would have learned the the Mail ran a story on January 4 about Princess Olympia's social life. According to the earlier story, Princess Olympia spent Christmas with her family at their home on Harbour Island in the Bahamas. On December 30, she flew to Aspen, Colorado, to spend New Year's skiing with friends, including Kyra Kennedy. Princess Maria-Olympia's mother, Marie-Chantal, is one of three daughters of Robert Miller, who made billions in airport duty free shops. Parsons' spring semester starts on January 25. The Princess may have flown from Los Angeles to London to spend some time with her family. On January 12, the Princess accompanied her father to Annie Liebovitz's exhibit, Women: New Portraits, in Wapping. According to her Instagram account, the Princess spent a few days in January in Los Angeles, where she attended an event at the Broad and also a Lakers game. This trip followed the visit to Aspen. So when did she squeeze in these dates (orchestrated by Princess Beatrice, allegedly) with Prince Harry without no one noticing, especially as Princess Olympia has been in London for about a week. This story is utter tosh, tripe, nonsense, and, totally made up. File it under fiction.